Bing is offering Ad coupons to all its new and old advertisers , with this you can start your ad easily and can save money . For starting ad you need to setup your billing and need to add a credit card or debit card (Not for India) or paypal (if you are in USA). after setting up billing you will be eligible for adding coupon NOT couponS , because bing allows only one coupon per acount. if you have already took benefit of bing ads coupon in that account then you can not add more coupons. Click Add Coupon, enter the coupon code, and then click Redeem. Select the country/region of your card’s billing address and click Next. Enter your payment information and billing address, and click Next. We will make a small authorization charge (for example, $1 USD) to verify your card. This charge will be removed. On the Payment Methods tab, click Add coupon, enter the coupon code, and then click Redeem. 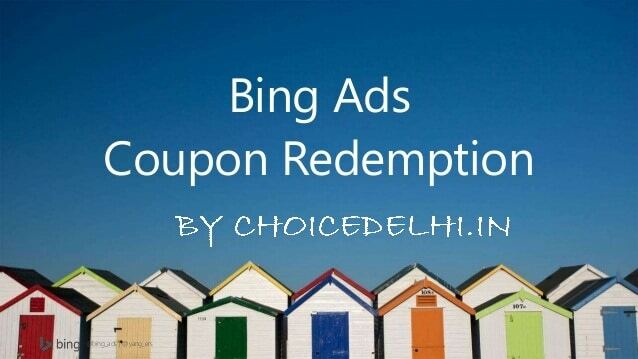 This setp by step guide for How to Redeem Bing Coupon will definitely help you . After you add a coupon code, it can take up to 10 minutes before your balance appears on the account Details, Payment Methods, and Billing tabs. As soon as you redeem the coupon, your ads are eligible to run and Bing Ads will deduct the cost of clicks on your ads from the coupon balance until the coupon is used up or it expires. At that point, to keep your ads running, we will start charging your primary payment method (postpay threshold account) or start deducting funds from your account (prepay account). If you do not have a prepay balance, we will pause your account until you add funds.